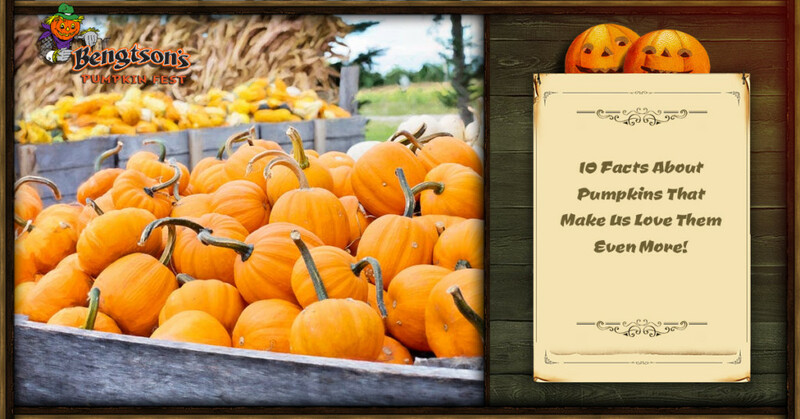 10 Facts About Pumpkins That Make Us Love Them Even More! Here at Bengston’s Pumpkin Fest, your favorite local pumpkin patch and fall spectacle, we are pretty obsessed with pumpkins. We love welcoming the public every year to pick out the perfect pumpkin from our expansive pumpkin patch farm, and even hurl pumpkins through the air with our famous Pumpkin Chunker as a sign of affection for the orange squash. Today, we wanted to take a couple of minutes to share our love of pumpkins with you by letting you in on a few crazy facts about pumpkins. Want to stop by Bengston’s Pumpkin Fest and pick up perfect pumpkin of your own? We are open seasonally until the day before Halloween. If you missed us this year, don’t worry. We’ll be back next year and better than ever! In the meantime, here are ten awesome facts about pumpkins to tide you over until next fall. The word ‘pumpkin’ comes from the Greek word ‘pepon’, meaning ‘large melon.’ So how did we go from pepon to pumpkin? As with many modern words, the term was passed between languages as cultures. First, the French adopted the word as ‘pompon,’ then the British changed it to ‘pumpion’ and it follows that the American colonists called the gourd a ‘pumpkin.’ Additionally, the word ‘pumpkin’ has no botanical significance. Generally in America, ‘pumpkin’ refers to the round, orange squashes we see sprawled across pumpkin patches, while we call many green or oblong pumpkins ‘squashes’. However in other countries, ‘pumpkin’ is often used for multiple varieties of winter squash. Speaking of winter squash, this classification makes pumpkins a type of fruit, even though many consider them a vegetable. Simply speaking, fruits are the seed-bearing structures of plants, and because pumpkins contain seeds, they are considered fruits. Let’s talk about that winter squash thing. Pumpkins, as well as other winter squash, are actually warm-weather crops. They grow best in soil temperatures above 70-degrees Fahrenheit and are generally harvested in the fall. So why is it called a winter squash? Because of their thick rind, winter squash is called such because they can be stored and eaten throughout the winter months without rotting. The “Pumpkin Capital of the World” is Morton, Illinois – about 3.5 hours from Chicago. Morton produces over 80 percent of the world’s canned pumpkin. To honor this, as of 2015, the official state pie of Illinois is, of course, pumpkin. The traditional pumpkin you see at pumpkin patches is called the Connecticut field pumpkin. This variety is characterized by being deep yellow or orange in color, having smooth but ribbed skin, and typically grows between 15 and 25 pounds. However, these are not the only stunning pumpkins. Pumpkins come in all sorts of sizes, shapes, and colors – even blues, reds, greens, and whites. Pumpkins are about 90% water, To compare, watermelons and strawberries are both about 92% water, peaches are about 88% water, cucumbers and lettuce both contain about 96% water and carrots come in around 87% water. Because pumpkins have such a high water content, they are relatively low in calories compared to other fruits and are a good source of beta-carotene and vitamin A.
Pumpkins might be the oldest domesticated plants on earth, with pumpkin and squash seeds found in present-day Mexico dating back over 10,000 years. At the time, large elephant-like mammals called mastodons roamed the continent. They commonly fed on thick-rinded squash and pumpkins, and their the stomping from their traveling herds made the perfect flat landscape for the weedy gourds to grow. As the mastodons died out, so did the squash. It is believed that when this happened, humans began to domesticate pumpkins and gourds, possibly for their ability to be dried and used as containers for water and food. The largest pumpkin in the world, on record, was grown by a Belgian man named Mathias Willemijn. At the final weigh-in in 2016, the pumpkin tipped the scales at a whopping 2,624 pounds, beating the previous record by nearly 300 pounds. That’s nearly 1,300 pies worth of pumpkin! At Bengston’s Pumpkin Farm’s rate of $0.39 per pound, you could, hypothetically, purchase a pumpkin this big for just $1,023 – and you would also need to rent a forklift to get it home! The idea for jack-o-lanterns was brought to America by the Irish, however, the original jack-o-lanterns were not carved into pumpkins. Instead, the Irish carved spooky faces into vegetables like turnips, rutabagas, beets, and even potatoes. A light was supposedly placed inside to ward off evil spirits. When Irish immigrants began coming to America in the 1800s, they quickly discovered that pumpkins were much easier to carve, and thus a tradition began. Starbuck’s famous Pumpkin Spice Latte first debuted in 2003. Since then, well over 200 million cups of the fall staple have been sold. The drink was developed in an attempt to expand the popular seasonal winter drinks, such as the Peppermint Mocha, into the fall season. Up until 2015, the drink did not actually contain any pumpkin. After complaints about the lack of pumpkin swept the internet, Starbucks altered the recipe to include real pumpkin and remove any artificial coloring. The best way to learn about something is to see it for yourself. Stop by our pumpkin patch and fall festival, located just outside of Chicago, and check out the awesome pumpkins and pumpkin-themed fun, food, and rides for yourself.